Capricorn 2018 horoscope indicates that career, relationships, partnerships & decision making would be taking the center stage in your life this year. New projects would boost growth and opportunities at work. You may find yourself getting too busy or spending late hours in the office. There is a possibility that you might lack motivation and inspiration to keep you going at work. This tug of war at work might create some pressure on your shoulders. The key to succeed at this stage is to stay calm and avoid the possibility of any errors in judgment and wrong decision making. You may find yourself a bit distracted or confused due to a new relationship. 2018 appears to be an eventful year for you with a lot on the cards. However, you may find it difficult to strike the right balance between work, family & relationships. This may just affect you in tapping the opportunities that come by and moving ahead. Even in the midst of all this you don�t appear to be bogged down. You should have the ability to set aside any pressure or difficulties and achieve substantial growth towards the latter half of 2018. 2018 horoscope predictions for Capricorn indicates a high-octane period at work. You are unlikely to have a dull moment at work. Opportunities would come shaping up new avenues of growth. Your involvement in new activities should give rise to profits and income. You appear to be putting in a lot of dedication in all your efforts. It even appears that work might take the front seat while other areas of life get pushed back. You might feel underpaid and unappreciated for your hard work and efforts. This should not be taken as a sign of negativity but something to bring out the best in you. The gains and benefits of the hard work that you have put in are not far behind and appear on the horizon. The good phase created by your efforts would not only be there in 2018 but would again come in your life during 2020-24. 2018 for Capricorn appears to be full of partnerships. However before getting into any relationship you should keep in mind that �all that glitter is not gold� It is advised to approach any partnership this year with caution as deception could be possible. Instead of relying blindly on people, choose your partners well and then make a move ahead. Avoid sharing any confidential work with a partner as this may not prove fruitful. The early part of 2018, especially February to May denote a positive time for growth. You might feel a little low on confidence and energy which may lead to losses. You may see a rise in competition during October & November 2018. Have faith in yourself and you should sail through this time smoothly. It is advised that you should not take major risks during this period however meeting new people is something you should not shy away from. An interesting period appears on the cards in forecast of Capricorn love & romance. The chances of getting in a new relationship appear strong after February 2018. Love would take the center stage during July & August 2018 with some very special moments coming up. October should be the month where your aspirations and dreams turn into reality. Try to be little clear in your thoughts as you may get a bit confused during October & November 2018. 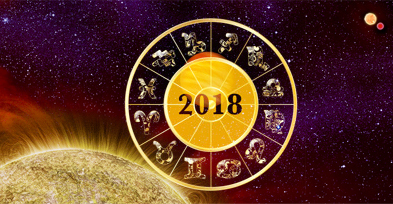 You should try not to take any major decisions before 18th November as this is the date after which you may see a turn of fortunes in love and romantic matters. It appears to be quite active and lively time in matrimonial issues. You may even see yourself in wedlock unexpectedly. Married life may get disturbed due to the possibility of doubts & even infidelity. During June, July & August 2018, spouse may go through a difficult period in terms of his/her state of mind. The year 2018 for Capricorn denotes good gains. However the first three quarters of the year appear to be quite hectic. You may find it difficult to get time for yourself or have some peace of mind. Taking advice from trustworthy and honest people should be good option this year. Taking mindful decisions this year would help. This is the month which requires best efforts in all endeavours. Moderate financial gains are seen with some losses. Expense on medical bills might increase as health is an area of concern. Manage your wealth and assets well to avoid any losses. Low energy levels are denoted with average name and fame for this month. After initial health issues the month would be positive towards the end. It would turn out to be a fortunate month for you. You are likely to achieve overall prosperity with a rise in personality and magnetism. Cash in hand gives you the ability to purchase expensive things. Better health this month should give you an improved earning capacity. You and your siblings appear to be enjoying wealth this month. Prosperity appears to be on the rise. Better financial well being is predicted owing to strong sources of livelihood. You might end up on a short pilgrimage as religion would be important this month. Wise & enthusiastic decisions would result in better financial status. You may take giant strides when it comes to making a name for yourself. Divinity & spirituality will lead you on a short pilgrimage. Dignity, honor, appreciation and respect at work are indicated because of your wise decisions. The emergence of a good leader is indicated with power & prestige by your side. Growth in job might also take place. You will be in authority at work. Avoid mental pressure and ego clashes this month. Fame and reputation appears to be on the rise. Government institutions are a great option for students seeking higher education. New ventures and job doers can expect some good gains. Prospects of progeny remain weak but social sphere may enlarge this month. This is bright month for working individuals. Financial and professional growth is possible. New projects would give benefits. Some issues on health front might bother you. Court cases & proceedings might burn a hole in your pocket. This appears to be a competitive month for you. You face some mood swings, arrogance & self-esteem with your spouse. Business partners would give better financial gains. Travel for business may prove beneficial. Spouse would also contribute share in the profits. The month denotes an unprecedented growth for spouse. Financial profits and business travels also appear fruitful. Business partners may become good sources of profits. Growth in your specific area of work is likely to take place. Manage your savings wisely. Try to plan well before making any major financial commitments. Your luck would be mostly in your favour. With possibility of some restrictions it will be a satisfying time. You might get religiously inclined with an urge for spiritual learning. You would be graced with courage, ego, intelligence, & taking initiative to do things. Overall it would be decent month for you. Fortune should favour you this month. Professional front appears to be doing well. Government jobs & family business would give credit & recognition. Some disharmony at home is denoted else the social arena remains strong. Education and assets are areas of concern. Promising in terms of financial gains can be expected this month. The professional front is full of prosperity. Credit & recognition for your work would be there. Getting a permanent job looks bright. Domestic harmony might be an area of discomfort. Cash flow and good income are highlighted. This will be balanced month. You might not enjoy much financial stability. Prosperity would come but with a few loses as well. Government work related foreign trip would give some rewards. Avoid getting into any scandals and any ego clashes this month.